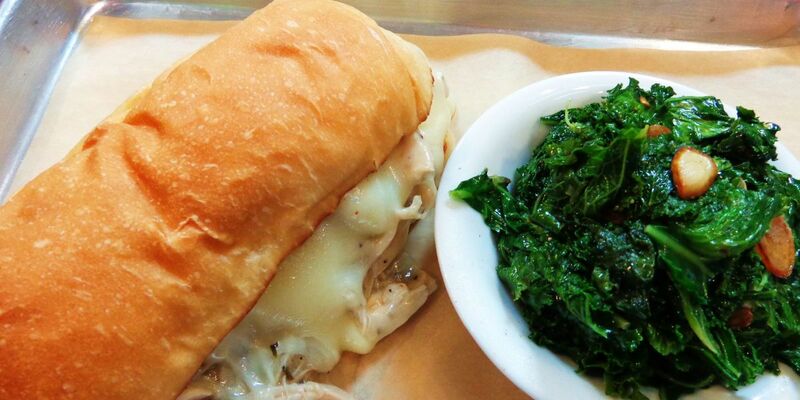 Press | The Alley Charleston | Eat. Drink. Bowl. 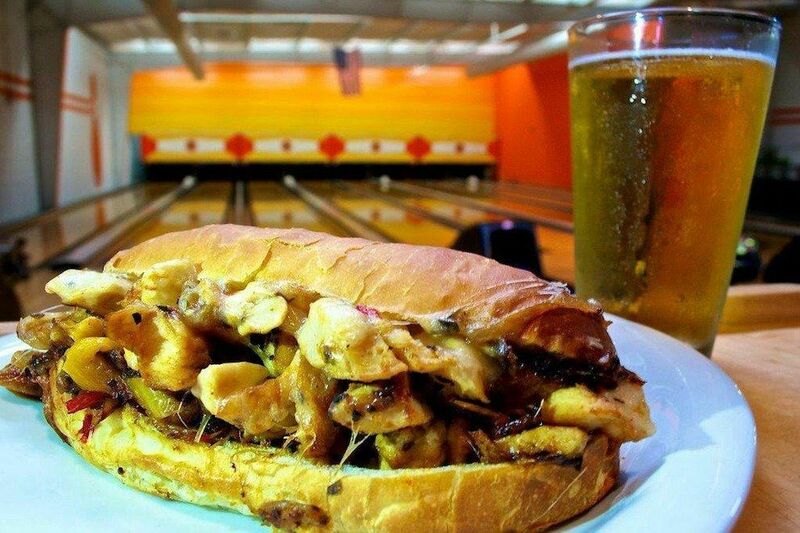 No matter how you like your burgers and beer, The Alley will set you up. 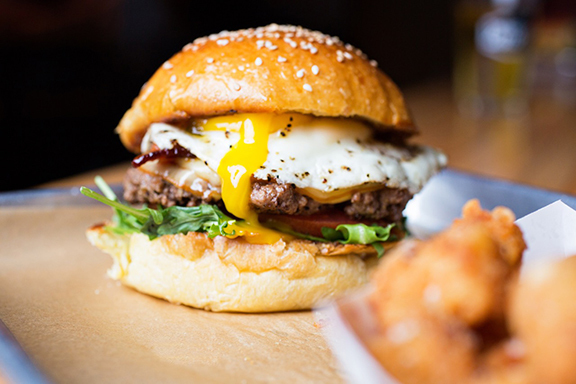 Gourmands can happily choose from dozens of brews as they settle into a Breakfast Burger with hot pepper jam and a fried egg; traditionalists will swoon over the chance to have an ice-cold Bud or a PBR with their American cheese-topped Classic. Tater Tots are a worthy indulgence for either camp. 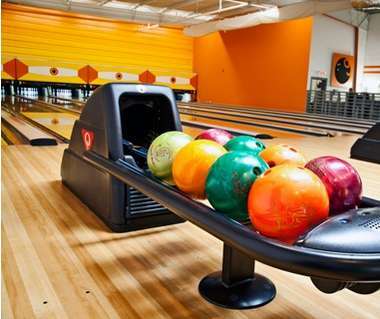 No reason to leave: The Alley is also home to Charleston&apos;s only public bowling alley. In addition to eight lanes, you&apos;ll find vintage video games, skee-ball, "Ping-Pong" tables and two giant projection screen televisions. 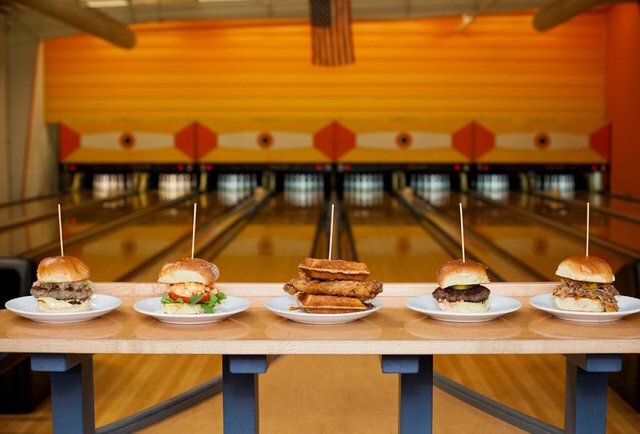 This 6,870&dash;square&dash;foot reclaimed warehouse opened in 2012 as a retro 1970s bowling center and quickly became a local celeb magnet, with eight lanes, vintage arcade games, and a 40&dash;foot bar made from recycled bowling lane wood. Fuel your game with oyster po&apos;boys, braised pork belly, and slow-roasted green&dash;chili chicken—served with a side of southern charm. (On Wednesday nights, kids eat free with a paid adult.) Saturdays call for a barbecue party on the outdoor patio and live bluegrass music. 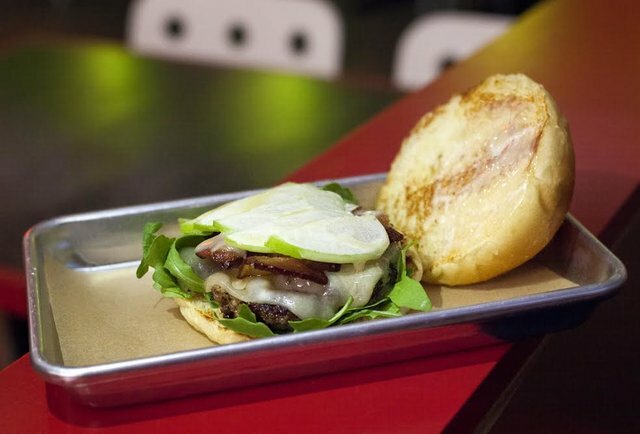 Prepare for New England on a bun &dash; this 6oz patty is topped with sharp white cheddar cheese, crispy bacon, thinly sliced Granny Smith apple, maple mayo, and arugula and is probably unlike anything you&apos;ve ever tasted before. This tradition originated at the Food & Beverage League night (it&apos;s a bowling thing), but gained infamy at The Alley Downtown. If you knock down all the pins on your first frame except for the five pin &dash; the one directly in the middle &dash; the pressure&apos;s on: your teammates are allowed to make as much noise as they want to try and distract you from sinking that last pin. If you miss it, you owe them &dash; and the opposing team?! &dash; a prize. Whether it&apos;s a round of shots or an order of tater tots, the penance must be paid. The Alley in Charleston has (you guessed it) bowling alleys. But also worth talking about are old&dash;school arcade games and their wings, which are damn good. The owners of The Alley challenged staff members to come up with their best wing recipes, and the Honey Habanero came out on top. 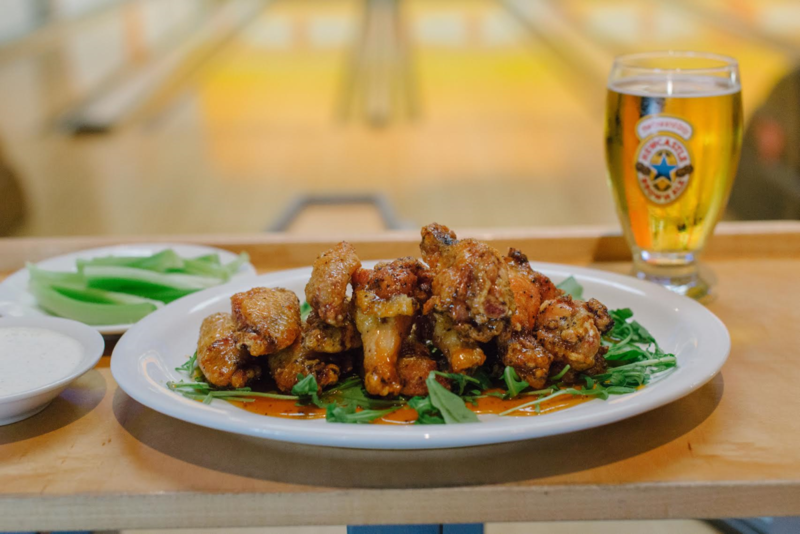 These winning wings deliver an irresistible juxtaposition of habanero spice and sweet, mellow honey. 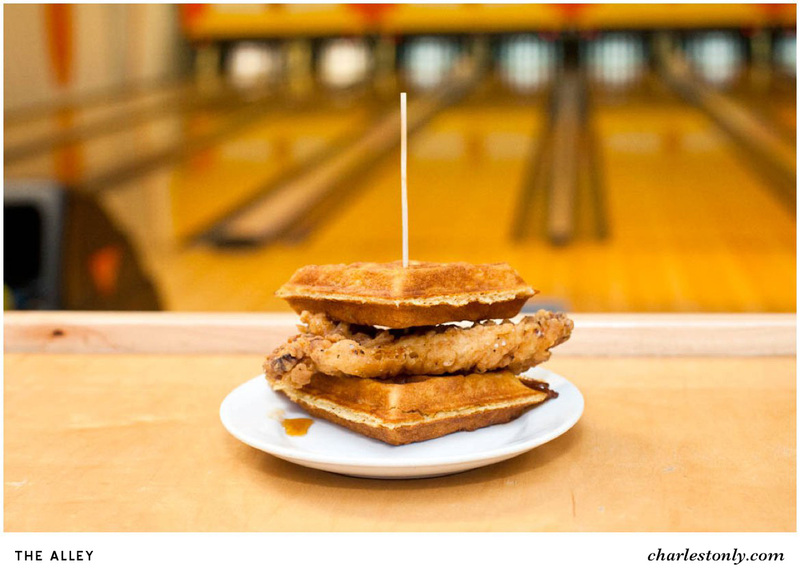 Sure, The Alley has retro bowling: eight memory lanes of reclaimed hardwood. And sure, there&apos;s the bar and vintage arcade, the colors and art stylishly aligned to the theme. But as for the food, The Alley obliges with more than throwback fare, accounting for another shrewd move from operating partners Jimmy Poole and David Crowley. Of course, The Alley is best known as Charleston's only downtown bowling alley, and for good reason. This retro-style bowling hotspot brings in bowlers of all levels to enjoy their squeaky clean lanes, open seven days a week. 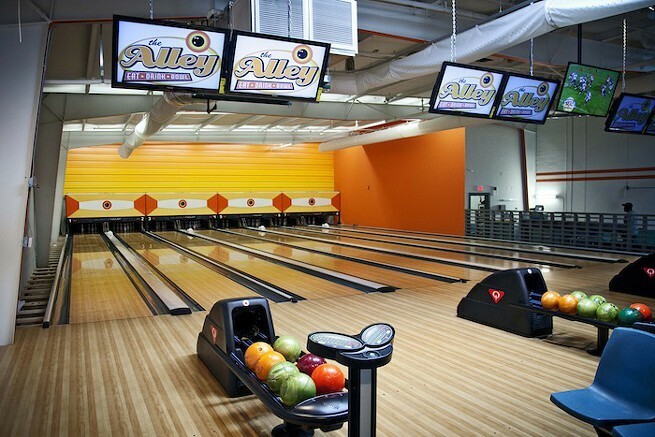 The Alley has so much more to offer than just bowling, which is readily apparent with your first step inside. Come to The Alley for a much better than pub-grub menu of burgers, sandwiches and salads, alongside a changing menu of local and regional craft beers. There's also a selection of arcade games to keep you occupied while waiting for your turn at the lanes. The Alley is a sports bar in every sense of the term, which is why you'll see every major college and pro game on the TV screens. Drink and play while you watch at The Alley! One meatball. That&apos;s all it took to convince me that the new Alley on Columbus Street wasn&apos;t a typical bowling alley. Earlier this week, while workers were still constructing the outdoor patio, owners Jimmy Poole and David Crowley gave me a tour of what will soon be Charleston&apos;s coolest event venue.